This is my first vintage Bulova watch, I bought it on eBay a few days ago. I haven't opened it yet so I'm not really sure what movement it has. The back has "M9" stamped on it so I believe it's from 1969. The back also has "To: William C. Marsh Jr. From: Kellwood Office 1-22-71" engraved on it. The watch is a little dirty and will need a good cleaning. So far it's keeping great time. It has a Speidel stretch band on it with a little calendar built in. The last month on the calendar is December 1975. Something that sets this one apart from the others is I noticed it doesn't have the date on the dial, I haven't seen any other Oceanographer that didn't have that. If anyone knows anything more about this watch I would love to know thank you. Hello Lmarvin13, welcome to myBulova. You say it's your first Bulova, does that mean there will be more? We call it Bulovitis, you should know that it is incurable and the treatments can be rather expensive. Your watch is an Oceanographer, a nice looking one at that. I doubt it's seen much 'wrist time' over the years. We always recommend a professional COA (clean, oil & adjust) if you plan to wear these old watches daily. With regular, proper service they can last several lifetimes. I've always liked these calendar bands. I have a couple new old stocks ones laying around here somewhere. You should know that even though the month pictured in Dec 1975 the dates line up to a month in almost any year, that one is the same as February of this year (other than showing a couple extra days of course). As long as you remember what month it is and that the month displayed might have one or two fewer or more days you can still use the old calendar. It looks to have originally been fitted with the black rally strap. Looking through the ads I found only one other Oceanographer that did not have either the calendar or the day&date; so perhaps not that common without it or a way to offer this model in a lower price bracket. 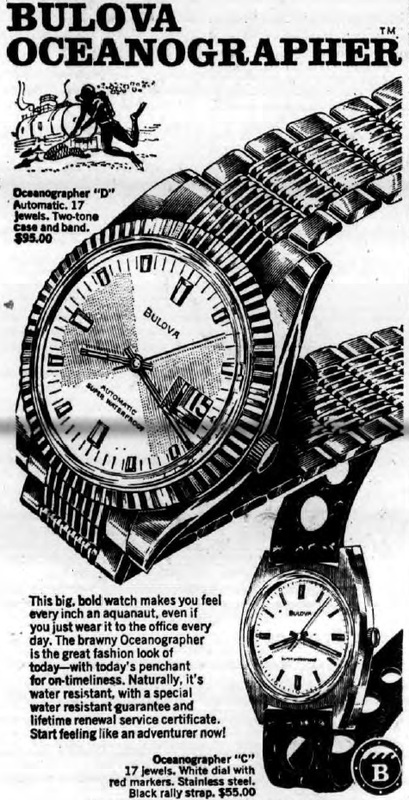 Dial in ad may show Waterproof instead of the 333 Feet on yours; laws around this time changed and limited advertising 'Waterproof' on watches that were not, so not a concern that it does not match. Agreed with the 1969 Bulova Oceanographer "C". At this point I don't believe the calendar strap makes a difference to the variant.